Elegant earrings, bold designs, interesting materials and a surprising number of everyday wearable designs were featured in the 2013 Spectrum Awards. I’ll be bringing you a selection of interesting designs in all those categories over the next few days. Today, let’s celebrate the best of the winning designs. My top six picks of the winners include the Best of Show, the luscious ruby Lava Ring by James Currens. Currens is a favorite to win the award every year, since his designs feature large top quality gems in lavish gem-encrusted designs. This year is no different. 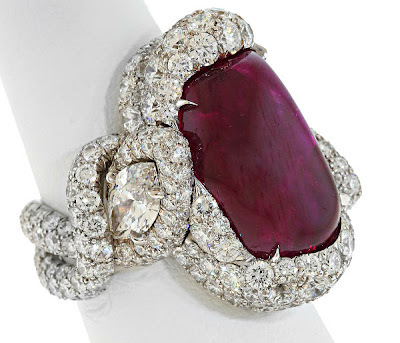 The Lava Ring features a 13-carat ruby cabochon with almost 9-carats of accent diamonds. The unusually shaped cabochon with juicy color, the marquise diamonds, the chunky pave and sinuous lines: it all works. See for yourself.